The world of Androva, where magic rules. Galen is the best underage magician for millennia, much to the dismay of the power hungry Professor Cassius. In the name of research, Galen and his friend, the talented but troubled Nico, begin opening time travelling portals to other worlds. Galen finds himself on Terra where he meets the beautiful Claudia. He wants to stay with her forever but the arrival of Jax and Shannon from two thousand years in the future changes everything. Galen must now return to fight for the lives of his friends and family. But will they survive magic? Alex C. Vick has built a rich and enchanting world of spells and sorcery in Surviving Magic. Classic themes of love, good vs. evil, and the importance of friendship run through the story, but they seem fresh and innovative in the hands of the author due to an exciting plot, diverse settings and interesting characters. Vick evokes place very well, and the juxtaposition of the two worlds of Terra and Androva is expertly done. The setting of ancient Italy is an interesting plot device that really works, as real historical events such as the revolt of Boudicca are seamlessly interwoven with magic. Vick also excels here with her use of tangible imagery; I felt as though I was strolling through the bustling streets of Pompeii! The book is written in first person narrative from Galen’s perspective. He is a flawed, but likeable hero and the love story between him and Claudia is heartfelt and authentic. The other less central characters are well-drawn, they all have distinctive voices and Vick’s use of dialogue adds humour and lightness to otherwise dramatic situations. Because we observe the full story arc of the characters in this book, I really came to care about their individual fates. Nico’s development is particularly interesting due to the complex nature of his internal struggles and motivations and the villain of the piece, Professor Cassius, is supremely creepy! Vick has developed a very complex and creative system of magic, which adds multiple dimensions and interest to the story. The only downside to this is it’s slightly overwhelming to have sygnuses, symbols, spells, and force fields thrown at you over a couple of pages (pheeew!) I prefer to be shown rather than told what is happening and there is some occasional info-dumping. I sometimes felt like I was getting lost down a portal myself! Because of this, the pacing seems off to begin with and the narrative is somewhat lost. Generally, though, the dramatic scenes are excellent and kept me on the edge of my seat. 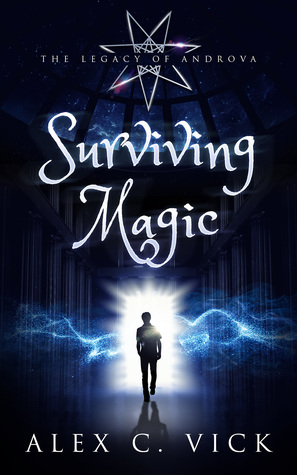 Surviving Magic becomes very much a standalone story, with originality and twists and turns galore. Overall, this is a great addition to the fantasy genre, and I look forward to more exciting adventures from the Legacy of Androva series.